On a cool October night in 1871, 18 Chinese men and boys were massacred by a bloodthirsty mob in Los Angeles. Debate continues over the actual trigger for the riot, but most commentators point to a fight between rival Chinese gangs in Los Angeles’ then-Chinatown on Calle de los Negros (today part of Los Angeles Street). The difficulty arose from a quarrel . . . [where both gangs] claimed a moon-eyed beauty, lately imported from the Celestial Empire, and from angry words the two finally came to blows. The disorder naturally called the police officers to the scene, and after much parleying and an attempted arrest [the gangs] finally fired at the officers, wounding both seriously. One of those injured, Robert Thompson, may not have been a police officer, and has variously been described as a saloon owner and rancher. Regardless of his profession, he died, and about 5:30 p.m., all hell broke loose. Women and children also aided in the massacre, and many rioters looted the dwellings of the poor, and now devastated, Chinese. 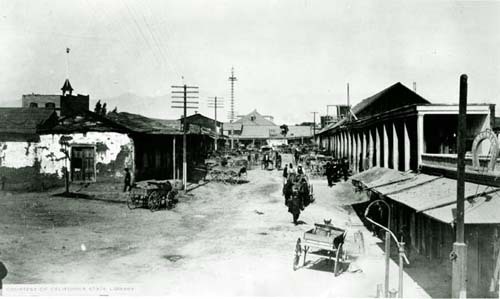 The riot ended at about 9:30 p.m. when Los Angeles County Sheriff James Burns raised a group of 25 “good and law-abiding citizens to follow him to Chinatown.”[ii] By some accounts, when they arrived the fighting had already ceased. At the end of the mayhem,18 people were dead, including at least 10 by hanging and four by gunshot. Several criminal and civil trials were held, and eight people were found guilty of manslaughter for the killing of Dr. Tung (Tong). They were Esteban Alvarado, Charles Austin, Refugio Botello, L.F. Crenshaw, A.R. Johnson, Jesus Martinez, Patrick M. McDonald and Louis Mendel, and each of these, except Mr. Botello, was imprisoned by the end of 1872. Some commentators believe the prosecution’s heart wasn’t in trying the rioters, and the ultimate outcome may help prove this point. Conspiracy theorists have argued that the lackadaisical prosecution was part of a plan by the town’s leaders to downplay the city’s troubles and improve its public relations, as well as hide the fact that many of its leading citizens were cheering the rioters on as the crowd lynched the innocent men and boys. In support of this theory, some point to the fact that many of the key actors involved in the massacre died by violence within a few years of it. One of the Chinese gang leaders was “hacked to death by an assassin,” and one of the defendants was “accidentally” shot when a rifle “fell” and the gun discharged into his chest (when he was alone with one of the police officers who was present at the riot). That officer later died in an explosion while working as a railroad detective, and a prominent member of the community who had allegedly cheered the lynching was “mistook [by] his friend for a deer” and accidentally shot twice! Second paragraph of “The Massacre” says “this act of civil disobedience lit a fire of hatred” not sure two gangs clashing and then shooting and killing people counts as “civil disobedience”. Not that the other side was civil either. Tragic and pointless all around.